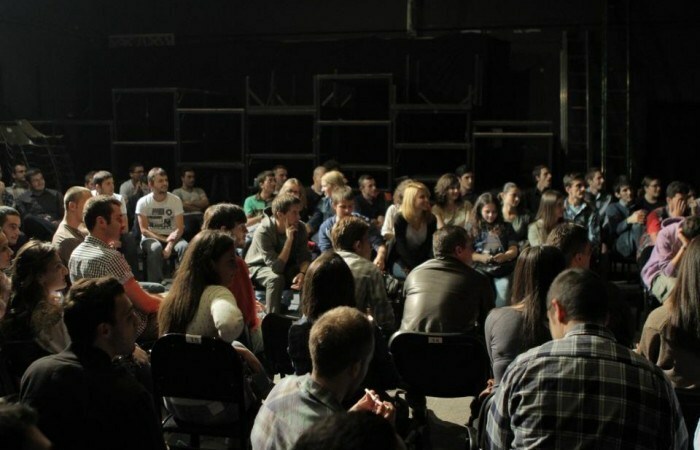 The BarCamp Prishtina continued its tradition with the eighth edition of informal meetings. One more time people had the opportunity to hear impressive stories in the Oda Theatre. More than 140 people attended this event and witnessed innovative stories from real protagonists. This was estimated to be the most extensive BarCamp organized so far. This round started with the AppCamp Pre-Event which was mainly about the Speedgeeking for the AppCamp participants without team members. The main point of this Speedgeeking was about getting the developer and designer community to know one another, especially the signed up AppCamp participants who lacked any team members. The second part of BarCamp continued with that what is the main idea behind this event- speakers section. Shpejtim Thaç and Dardan Islami were the main speakers. A 27 year old English teacher from Malisheva, who had the brilliant idea of producing chalkboard material in Kosovo, explained for the BarCamp audience how he got the idea, how he managed to get help from USAID YEP (Young Entrepreneurs Program), how he got the government to ban toxic material from schools, how he got his first schools to sign up, etc. Shpend Lila from USAID YEP was also there to answer all the questions from audience. The founder of Urban FM Radio, one of the first podcasters in the Balkans, the first Kosovar Standup Comedian, and an entrepreneur, Dardan Islami was there to tell the audience his life story. He told the story of how he went with nothing to the UK as a teenager and became one of the most renounced bartenders in London, how he went to Canada to study journalism, got back to Kosovo during the war and joined KLA, and then continued to live in Kosovo where he founded Urban FM Radio.